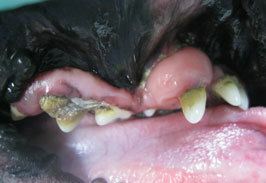 Dental disease affects 80 percent of dogs and 70 percent of cats over 3 years of age. It is one of the most common health issues seen in our pets and is a source of pain and infection. Dental health is important for not only the health of the mouth but the entire body. Infection in the mouth can spread through the body affecting the heart, lungs, kidneys, and/or liver. Some of the diseases that can be seen in organs affected by the dental disease are: heart valve infection, endocarditis (infection of the heart muscle), pyelonephritis (kidney infection), hepatitis (liver infection), bronchitis (airway infection/inflammation), and pneumonia. There are also health conditions (such as diabetes, feline leukemia, FIV) that can predispose a pet to periodontal disease. In turn, that periodontal disease can cause issues with management of the health condition. Periodontal disease occurs in progressive stages. Plaque forms on the teeth trapping bacteria in the mineral formation above and below the gum line. The plaque hardens into tartar. Periodontal disease starts with gingivitis (inflammation of the gums) occurring due to the tartar formation. The gingivitis progresses to infection and inflammation of the tooth structure below the gum line. As the infection and inflammation extends along the entire tooth structure, instability results and there is permanent loss of the tooth. 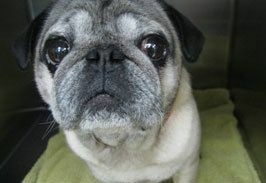 Smaller breeds are more predisposed to periodontal disease due to a higher rate of overcrowding of their teeth, malocclusions (abnormal bites), and because their teeth have shorter roots than larger dogs so less bone loss has to occur before the tooth becomes mobile. 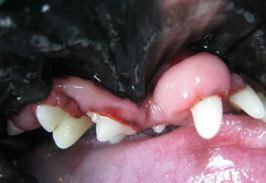 Larger breed dogs that have malocclusions are also predisposed to periodontal disease. Periodontal disease is treatable, but most importantly it is preventable. Dental care takes place in two forms: professional care and home care. Professional care includes: an oral examination by your veterinarian to assess the health of the mouth, gums, tongue and teeth, professional prophylaxis with scaling and polishing if tartar formation is seen, and treatment of any disease process seen. Home care includes: brushing teeth on a daily basis to slow the progression of plaque and tartar formation, use of dental chews to slow the progression of plaque and tartar formation, and minimize the feeding of treats high in sugar content that will promote plaque and tartar formation. Home care should be a maintenance regimen that occurs between the periods of professional care. For pets the professional cleaning must occur under anesthesia. The professional cleaning includes: scaling of the tartar from the teeth above and below the gum line with an ultrasonic scaler that vibrates, probing around each individual tooth assessing for evidence of underlying disease, dental radiographs to assess the underlying tooth structures, and polishing of the teeth to remove micro-etches which serve as scaffolding for the tartar to easily re-attach to the tooth. All these sounds and procedures would be difficult to perform thoroughly and safely on an awake pet. Performing dental cleanings without anesthesia usually results in oral disease going unnoticed and untreated. This can prolong discomfort and health risks for the patient. Non-anesthetic cleanings also result in a partially clean mouth, normally with only part of each tooth fully cleaned and returned to maximum health. Dental disease is expensive to treat. In the long run it is less expensive to prevent dental disease, and your pet is happier and healthier.